Terrariums can bring a slice of nature indoors to be enjoyed at all times and in all seasons. They are one step ahead of individual houseplants as you can have a number of plants living together, forming complete ecosystems inside the small enclosed area. Once established, they are easier to maintain, too. Terrariums are typically made of a transparent material to allow maximum light exposure to the plants. Glass is the traditional favorite. Today, you can choose from several materials, each with pros and cons. Glass is long lasting and easy to clean as well as resistant to scratches and mold. Glass containers are widely available in different shapes and sizes, from drop shapes to egg shapes. However, they are heavy and carry a risk of breaking, especially around children and pets. Acrylic containers are seamless, durable, and lightweight. They are practically unbreakable. Unfortunately, they are also easily scratched and require special cleaning agents and techniques. Acrylic containers are also frequently more expensive than glass. Plastic containers are thin walled, lightweight, and cheap. Plastic options are safe for children, pets, and for hanging arrangements. However, they may lose transparency due to aging or mold/dirt collection. 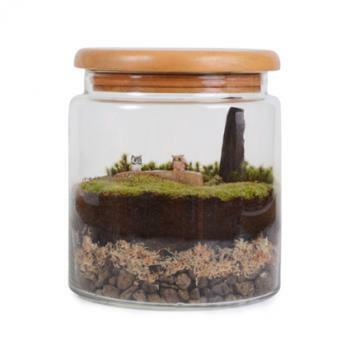 Even a mason jar with a cactus growing inside can qualify as a terrarium, but for larger terrariums, decide on the type of mini-world you're going to put together. Different plants thrive in different environmental conditions, so you'll want to choose accordingly. Create a woodland scene or a xeriscape or, of course, anything in between. Small size, attractive foliage, and slow growth are features to look for in terrarium plants. Low-light may also be a feature you want to consider looking for in your plants. For partially or fully closed terrariums, the ability to live in high humidity is needed. These plants like low-light and high humidity. These plants are perfect for a xeriscape terrarium with high-light and low humidity. You can get these plants from the nearest garden center or order them online from websites like Josh's Frogs, Glasshouse Works, and Florida Hill Nursery. Many suppliers have plants in tiny pots meant especially for terrariums. You can make your own set by using rooting cuttings in small pots. Like the plants, materials can be purchased from garden centers or from online websites like terrain, which has almost everything from the container to moss to stones. Another place to check is Twig Terrariums, which sells kits that include everything you need plus some additional supplies. Don't forget to check out your local big box home and garden store like Home Depot, which will see everything from sheet moss to rocks. Clean it thoroughly and dry it. Aquariums, tanks, and wide-mouthed glass jars are excellent for this purpose. Terrariums in narrow-necked bottles are very charming, but extremely difficult to set up. The bottom ½" to 1" should be loosely packed with a layer of rocks, pebbles, and charcoal. Cut the plastic mesh to fit the container and lay it flat over the rock and charcoal layer. Place a ½" layer of dampened sphagnum moss over the plastic mesh. Since the terrarium does not have drainage holes, any excess moisture will collect here. This layer will hold some air too. Charcoal absorbs toxic substances and foul odors. The mesh and moss layer will prevent soil and plant roots from sitting in water. Using the trowel and a cone made of the thick sheet of paper, gently pour the soil in. You can use regular potting mix for houseplants or special mixes suitable for your choice of plants here. Add some crushed charcoal to the soil to keep it sweet. Use the spoon to move the soil to edges and corners. Soil at a higher level at the back and low at the front will make the interior look bigger. But if it is to be viewed from all sides, a central high area with low lying edges is best. The thickness of the soil layer can be anywhere from 1" inch to 5", depending on the size of your container and the plants. As you build up the soil layer, you can line the edges of the container with rocks and pebbles so that the soil layer will look interesting when viewed from the outside. Mist the soil to make it slightly damp. With the plants still in their pots, arrange them over the soil and mark the spots with small pebbles. Now take out the plants and make small holes in the selected spots with the spoon. Gently remove each plant from the pot and plant it in the hole using the spoon and the fork. Start at the back and move forward as you plant. After all the plants are in place, break off pieces of sheet moss and place it over the soil in a single layer. You can either cover the entire surface with moss or make a pleasing arrangement with moss and pebbles. This layer will stabilize the soil. In a xeriscape terrarium with cacti and succulents, the soil is covered with sand and pebbles instead. Water the plants to help them settle down. Use focused sprays to clean the sides of the container and the soil on the plants. Wipe excess moisture from the sides and keep the terrarium in a bright place for a few days to dry out slightly. Sealing the terrarium is optional. A sealed terrarium will have a microclimate inside, where the water cycle and the gas exchange take place independent of the outside environment. Once you seal it off, you practically stay hands off, and the terrarium will run on its own steam, literally and figuratively. Keep the terrarium uncovered for a few days before sealing it off. Remove dropped leaves and dead plants. When the plants are established well, you can cover the container with a glass top and check for moisture level. If the sides are clouding up with mist, it indicates too much moisture. Leave it partially open for a few more days and check again. Slight condensation in a corner is fine. Put on a tight-fitting cap and enjoy the bottled piece of nature. Sealed terrariums should not be exposed to direct sunlight. 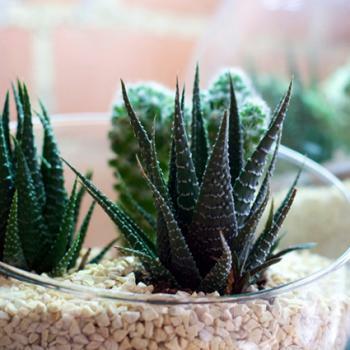 Cacti and succulent terrariums and those planted with high-light plants are not sealed. Be very careful when you open a tightly closed terrarium. The world inside will be warm and humid like a tropical forest, and the sudden exposure to dry air will make the entire 'forest' wilt right before your eyes. Open a little at a time, and mist the plants, to slowly acquaint them with the outside environment. After finishing the pruning and cleaning chores, reseal them gradually as before. These arrangements are low maintenance, and can stay pretty with a little care. A partially or fully open terrarium needs watering from time to time. Check the soil for dampness before watering. Soil can be damp to touch, but never wet, for woodland terrarium, and nearly dry for desert landscape. Add water only if necessary. 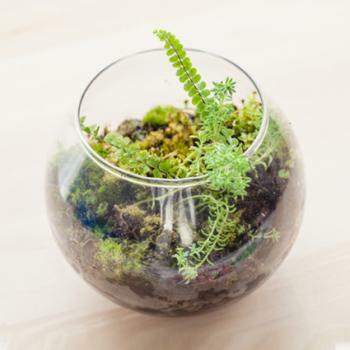 Remove dead and rotting plant material promptly as rotting material can quickly spoil a terrarium. Once rot has set in, you'll have to overhaul the entire set up. Use tweezers and tongs to remove debris. If you see any pests on any of the plants in the terrarium, remove those plants and replace them with new ones. Overcrowding should be avoided for aesthetic reasons as well as to keep the plants healthy. Hold the branches to be pruned with tongs and use long-handled scissors or clippers to cut them, removing them from the container as you go. Humidity in the container and condensation on the walls will promote algal growth that will affect the transparency. Clean with a piece of cotton soaked in houseplant cleaning spray. 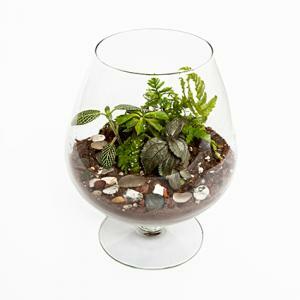 Terrariums give you a great opportunity to let you express who you are. After you get the terrarium set up you can, if you wish, put some small trinkets inside. Some people put in small plastic animals, seashells, or something that is special to them. Personalizing your terrarium can be great fun and they also make really nice gifts for that special someone.